Departing London on Saturday 21st April, each are wearing compact Ocean Signal rescueME PLB1 personal locator beacons, which are 30% smaller than comparable models. These 406 MHz beacons can be quickly activated in an emergency, even with only one hand, to contact rescue services and provide accurate positioning for at least 24 hours. They are also carrying a comprehensive set of Pains Wessex flares from WesCom Signal and Rescue. These will include two multi-packs of personal miniflares, as well as four red parachute rockets and eight red and white handheld flares – able to withstand immersion and still ignite with reliability. She continued: “The rescueME PLB1 is perfect for our expedition. It’s small and light, which means it’s easy to have while we are kayaking and fits well in our lifejackets, giving quick access in an emergency. If we did send out an SOS, the fact it will show our location for at least 24 hours is great as we can be very remote on rivers as well as on the coast. It really is the ideal piece of equipment to have on board and reassures us we are never too far away from help. The girls are taking on the challenge to raise money for Pancreatic Cancer Action in memory of Kate’s father, David Culverwell, who died of the disease in 2015. Kate and Anna hope their expedition will increase awareness of the disease, which has a survival rate of below 5%, and fund research into early diagnosis. Throughout the trip they are also collecting and testing water samples for FreshWater Watch. This project is investigating the health of freshwater ecosystems around the world and aims to find solutions to tackle pollution. James Hewitt, Sales and Marketing Manager at Ocean Signal, said: “We’re delighted to be helping Anna and Kate on their cross-Europe kayaking challenge, raising money for Pancreatic Cancer Action. The rescueME PLB1s are the ideal piece of kit to bring peace of mind throughout their adventure. 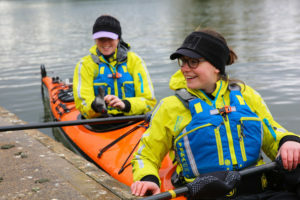 After leaving London, Anna and Kate’s route will see them paddle round the Kent coast before heading across the Channel to the Canal de Calais. They will then travel inland using a network of rivers and waterways to make their way through France, Belgium and into Germany, spending most nights under canvas. Joining the Danube for the remaining 2,4000km, the girls will pass a further nine countries bordering this river – Austria, Slovakia, Hungary, Croatia, Serbia, Romania, Bulgaria, Moldova and Ukraine – before finally reaching the Black Sea after three and a half to four months.